Images, hosted at the Library and Archives Canada, will often be able to provide additional details. Following the Act of Union in 1841, the Province of Canada was formed. It consisted of Canada West (Ontario) and Canada East (Quebec). The 1851 census also collected population details for New Brunswick and Nova Scotia. While the census for New Brunswick and Nova Scotia was collected in 1851, the census for Canada West and Canada East did not get underway until 12 January 1852. Unfortunately, the original paper records of this census were destroyed in 1955 following the microfilming done by the Dominion Bureau of Statistics. The process and quality of the microfilming were not consistent and has resulted in some images being of poor quality. For images that are difficult to decipher, refer to the breakdown of column headers on the search screen to assist you. Please keep in mind that terms used to describe ethnic origin and mental capacity are reflective of the time period and are not considered reflective of current usage. If the image continues to prove difficult to read, try downloading the image and opening it an image editing program on your computer. Increase the contrast and experiment with various settings to improve legibility. To navigate the images to see all the columns pertaining to a particular individual, you will need to click on the image link found in the transcript (*Source image*) and then manipulate the URL there. 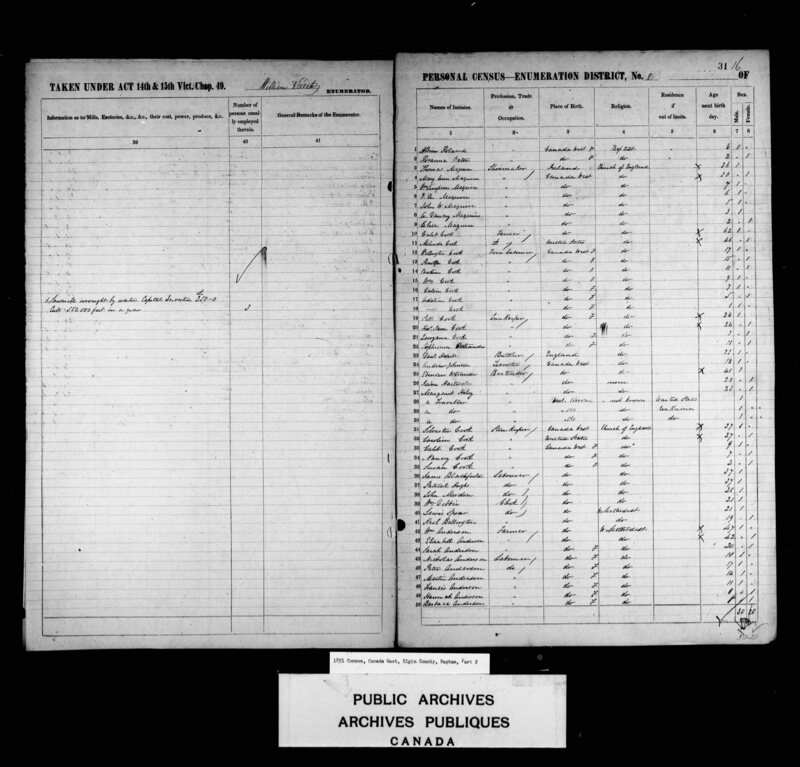 For example, if your ancestor were located on this page, http://data2.collectionscanada.gc.ca/e/e094/e002346999.jpg, you would edit the number in the URL so that instead of ending in -6999 it ended in -7000, allowing you to see the next page.